Keep fresh water available for your livestock throughout the winter with the Farm Innovators Rubber Flat-Back Heated Bucket. Ensuring your horses and cows have water at all times keeps them healthy. This bucket, with its wealth of features, was designed with the safety of your livestock in mind. It holds a generous 4.75 gallons, and demarcations along the back help you maintain the proper water level. The flat back enables the unit to rest against a wall easily, while the natural and recycled rubber construction offers durability. The heating element, hidden in the bottom of this bucket, is thermostatically controlled, operating only when necessary to save on electricity. Its 60" long cord has a chew protector along it, to prevent damage from animals, and its flexible body resists cracking in cold weather. Hang this bucket with the sturdy metal handle, or place it on the ground for added options. 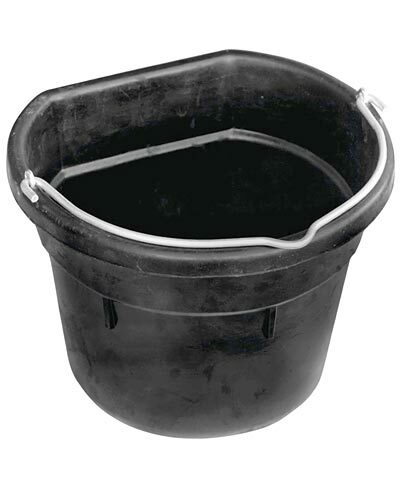 Offer fresh, not frozen, water to your livestock in this Rubber Flat-Back Heated Bucket. One year limited warranty.